“City of Lies” by Ramita Navai. Ramita is a bit of a Social Justice Warrior, traveling the world and telling you what's wrong with it. Tehran, Iran was seen through that lens. Still, very interesting vignettes that point out a lot of the hypocrisy and contradictions, as any outside culture would look to "outsiders". Definitely worth the read, if you like cultural travel books. My knowledge runs deep into security, but I loved the book: through I wanted it a bit more technical in some areas and a bit tighter overall. Definitely a good book for futurists who want to think about what the future might look like as these hacks and attacks become more common. 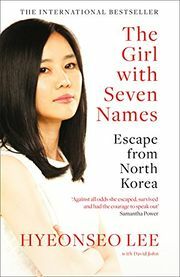 The Girl with Seven Names: A North Korean Defector’s Story, is a really good book about a spoiled girl (with 2 more names than I have), from North Korea, who selfishly and irresponsibly escapes from North Korea, and gets astonishingly lucky in the whole process. Then creates a better life for herself, convinces her family to leave, and burns down any opportunity for them to stay or go back to the oppressive regime. While it is a bit of a narcissists tale of suffering, we were all narcissists at her age. And despite her being brash (not thinking ahead) and suffering consequences for her recklessness (including to those around her), it is still wonderfully eye opening to see North Korea, Korean culture, and the world through the eyes of a teenage girl, who slowly learns how lucky she has been (though the bigger hardships of those around her). And where would the world be, if there were at least some silly/brash kids risking everything to have a better life? Islam: A Short History is a 2000 book by the British writer Karen Armstrong, a former Roman Catholic nun and author of popular books about the history of religion. Her book tries to offer context and corrections about the negative stereotypes: extreme faith that promotes authoritarian government, female oppression, civil war, and terrorism. While some of that reputation is earned, it's not always for the reasons people think. Rick Atkinson won the Pulitzer with his personalized view of WWII in Europe. From the invasion of North Africa, to the conquest of Italy (the forgotten war), through to the taking of Berlin, he enjoys quoting letters and telling stories from various men (many of which are destined to die). He loves the color and the humanizing of events, talking about the interpersonal politics of what was going on, all from a very western-centric view. But it gives his books a readability and different perspective than most others on the topic. Judge Napolitano offers a refresher (for political history buffs) of the 17th Amendment and some of the unintended consequences of progressivism: like the scope creep of the federal government once we removed the checks and balances that was the 17th. Fun book into what the author coins as Behavioral Economics -- which amusingly blurs psychological behavior (and human irrationality) with economics, and looks at how people behave. (Which isn't really economics, but amusing none-the-less). Here are just a few of the folks either being operatives for the Russian government, or at least belonging to groups affiliated and helping them. Tydings 9, Amerasia, Rosenberg spy ring, Army Signal Corps Intelligence Agency (SCIA), and more. Instead of this being an invention of McCarthy's imagination, it turns out virtually all of the people on his lists were put on them by professional intelligence agents, and were suspected for very valid reasons. If not of being spies, of certainly being friends to many people who were later exposed as spies: Dorothy Kenyon, Esther Brunauer, Haldore Hanson, Harlow Shapley, Frederick Schuman, John Stewart Service, Owen Lattimore, Philip Jessup, T.A. Bisson, Solomon Adler, Nathan Gregory Silvermaster (and his wife Hellen/Elizabeth), Lauchlin Currie, Harry Dexter White, Harold Glasser, V. Frank Coe, David Karr, Julius and Ethel Rosenberg, Annie Lee Moss, Aaron Coleman, Barry Bernstein, Robert Oppenheimer, Leonard Mins, Cedric Belfrage, Mary Jane Keeney, Franz Neumann, Theodore Geiger, William Marx Mandel, Alger Hiss. The Big Lie: Exposing the Nazi Roots of the American Left is a book that just reiterates the unsavory parts of the left's history that they would rather you forget. Jonah Goldberg covered this ground better in "Liberal Fascism", but it is still a readable book with Dinesh's own style and observation. What you'll get out of it is inversely related to how much you know about the History of the American left, and how insightful you are already. For me, it was an entertaining and fluffy read with a few new insights but lots of confirmation bias. For somewhat unawares about the dark side of progressivism, or the left side of fascism, it'll be jaw dropping and fascinating. But if you're a partisan lefty, you'll feel that it's all lies and disinformation... just like the mirror and scale are lying to you. A relatively unknown and failing author and Socialist by the name of Upton Sinclair wanted to write a political propaganda book, so he went under cover in 1904 in Chicago meat packing plants, and by 1906 he completed his semi-fictional hit piece called, "The Jungle". Teddy Roosevelt had immediately put a team of government inspectors on it, and they concluded in the Neill-Reynolds Report that the book was, "intentionally misleading and false", "willful and deliberate misrepresentations of fact", and "utter absurdity". Now it was the Progressive era, so the truth doesn't matter as much as the opportunity to regulate, so Teddy suppressed the release of the report to the public and used the book (by an author he had dismissed as a "crackpot"), as an excuse to create more federal government (the Pure Food and Drug Act, and the Meat Inspection Act), which later became the FDA. While the book and its ideas were completely debunked at the time, it's still taught in schools (Marxist re-education camp) today. This was the start of what we called crony capitalism and the explosion of corruption: once the fed had control over things like this, you could pay-off the correct politicians to get past inspections, or guarantee your competition did not, which resulted in consolidation (reduced competition, and higher prices). The full title is like reading the back cover. Blacklisted by History: The Untold Story of Senator Joe McCarthy and His fight Against America's Enemies by M. Stanton Evans. But it's fascinating, well researched, vivisection of the myths and propaganda that altered what happened and why, in the public's mind. It turns out McCarthy's name should remain synonymous with libelous witch hunts, not because he was the perpetrator of them, but the victim of it. I love the Freakanomics books and podcast. A lot of it is confirmation bias: I already think like a freak (much of the time), so most of their stories were snippets of things I'd read, or ways that I try to approach problems, or ways I like to think. But reminding me of all the unintended consequences, and remembering to solve the right problem, just makes me happy. It's easy to get in ruts, or think small, like answering people's questions -- instead of stopping, pausing, asking what they REALLY are trying to get to, and answering that instead. Thomas Piketty is a French Economist (and woman-beater), who used Emmanuel Saez's discredited research (study) on how things haven't gotten better for the middle class, as the basis for his new socialist manifesto called Capital in the 21st Century (a play on Marx’s Das Kapital). Economically, the study/book was crap: politically, it was gold. It told the left leaning and their media what they wanted to hear. So it made the NYT best seller list in Fan Fiction, and everyone talked about it. It was peer reviewed and debunked in spades, but not before the gullible gobbled it up as a tasty plate of confirmation bias. Nom nom. "Win Bigly" is hit or miss. It's very interesting/enlightening on analyzing how persuasion of the public (or individuals) works: a fairly cynical analysis of humans willingness to gobble down confirmation bias. (From a mile high view). And he touches on negotiations. Scott had predicted Trump would win early (based on his powers of persuasion) and he explains why. He's not necessarily a fan of Trump... (he voted left in most prior elections)... but this book is filled with where he thinks Trump is dead on-target with some of his distractions and persuasion efforts, and that can be a hard read for some (even if the point is about persuasion, not likability/morality/positions). This page was last edited on 30 January 2019, at 19:35.